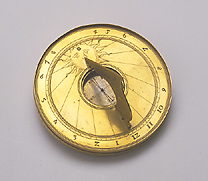 This sundial is made up of a gilt brass disc engraved with the hour lines. It bears a compass to allow the instrument to be oriented towards North, and a gnomon, the shadow of which is projected onto the hour lines to allow the time to be read. Although the instrument is unsigned, the style in which it is made and the fine and elaborate engravings suggest that the instrument was made as an object for a princely Renaissance collection. The instrument, which is linked to a group of mining instruments, was brought from Germany by Prince Mattias de' Medici.